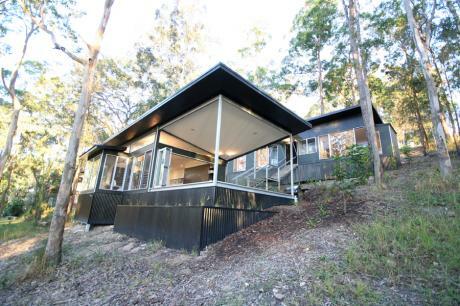 Set on a sloping forest site above Smith Lake on the NSW central coast this weekender is divided into living and sleeping pavillions stepping down the site and connected by a butterfly roof covered stair. The house is conceived as sophisticated camping, with the living area opening to a large covered deck which extends the interior into the natural forest of the site. The structure was all prefabricated and with screw in piles used for support there was no excavation on the site. Materials are all non-combustible as the site is within a high risk bushfire area. Fire protection sprinklers on the roof also cool the house when needed with rainwater stored in tanks under the floor.